Quest Super Once a Day is an everyday supplement to support optimal well-being. It contains nutrients that contribute to the reduction of tiredness and fatigue including Folic Acid, Iron, Magnesium, Niacin (B3), Pantothenic acid, Riboflavin (B2), Vitamin B12, Vitamin B6, Vitamin C.
This is a high potency all in one formula, providing 17 vitamin and vitamin related ingredients, 12 minerals and 12 additional factors to augment dietary intake where needed. The minerals are chelated to a blend of amino acids to maximise absorption. 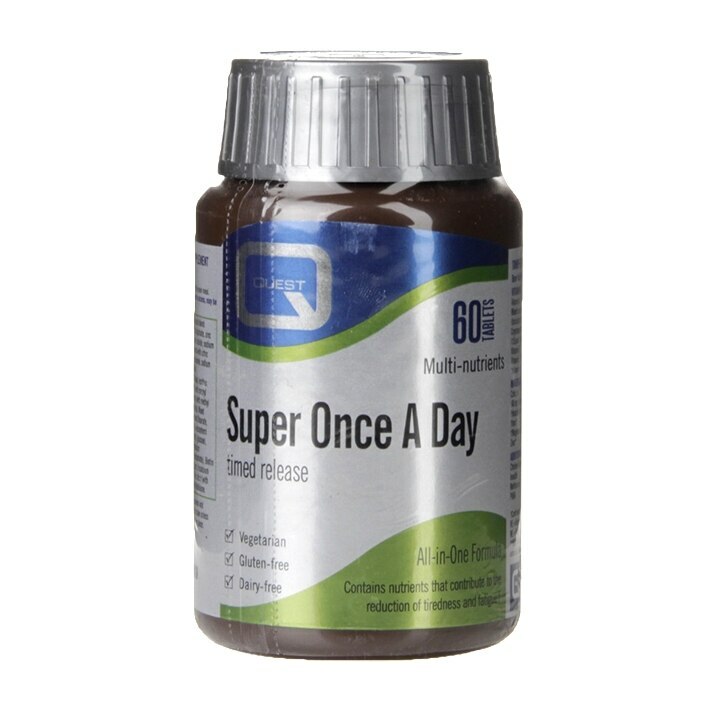 Contains a gentle form of iron which is less likely to cause constipation or digestive discomfort. This patented timed release tablet is designed to release nutrients over 6 hours and optimise absorption of water-soluble vitamins. Do not exceed the stated intake unless instructed by a qualified health professional. This product contains Iron which, if taken to excess, may be harmful to very young children. Keep out of sight and reach. Dicalcium Phosphate, Multimineral amino acid blend (providing calcium carbonate, magnesium oxide, ferrous sulphate, zinc oxide, manganese carbonate, copper sulphate, potassium iodide, sodium selenite, chromium chloride, sodium molybdate complexed with citric acid, glycine, rice flour, rice protein complex, sodium hydroxide, sodium citrate, aspartic acid and maltodextrin), Vitamin C (with Hydroxypropylmethylcellulose), Hydroxypropylmethylcellulose, Non-GM soy lecithin, Vitamin E (natural source vitamin E from non-GM soya), Pantothenic Acid, Vitamin B6 (with Methyl Cellulose), Riboflavin, Niacin, Choline Bitartrate, Thiamin (with methyl cellulose), DL-Methionine, Inositol, Para- Aminobenzoic Acid, Mixed Carotenoids (with gelatin, sucrose, olive oil, ascorbyl palmitate, Non-GM Mixed Tocopherols, silicon dioxide), Magnesium Stearate, Citrus Bioflavonoids, Lysine HCl, Beta-carotene (with D-α-tocopherol, sodium ascorbate, ascorbyl palmitate, corn starch, glucose), Vitamin A (with antioxidant: tocopherols and tricalcium phosphate), Betaine HCl, Vitamin B12 (with dicalcium phosphate), Biotin (with di-calcium phosphate), Vitamin D3 (with Arabic gum, tricalcium phosphate, D-α-tocopherol), Papain, Rutin, Cysteine, Folic Acid (with dicalcium phosphate), Glazing agent: Hydroxypropylmethylcellulose. Quest Vitamins Super Once a Day Multivitamin Tablets is rated 4.9 out of 5 by 8. Rated 5 out of 5 by Samuella19800 from Amazing. Love these Can't live without these. They help fatigue so much. Rated 5 out of 5 by wonderboy from quality product THE DOUBLE PACK IS GOOD VALUE AND THE DELIVERY WAS VERY PROMPT. Rated 5 out of 5 by High Energy Mike from Quest Vitamins Super One a Day Multivitamin tablet With my busy life I had a period of about 6 weeks where I had not re-ordered these vitamins I have been taking for years. Without making a connection, during this time I had been feeling low on energy and really lethargic, so assumed I had some lingering viral infection. However, when I re-ordered these tablets and starting taking them again, I noticed that within 3 - 4 days I had gained my energy levels back again and no longer felt tired when I woke up and later in the day. This has now removed any remaining doubts and scepticism I may have had as to how beneficial these are for general health as well as overcoming fatigue. I will not stop using these again...I am converted 100%. I originally heard about them from my wife who has been taking them for many years.